Magnetic levitation (Maglev) is a technology of magnetically suspending an object without other support by using a magnetomotive force source such as electromagnet, permanent magnet, or superconducting magnet. The Linear Chuo Shinkansen (Superconducting Maglev Railway) which is scheduled to start its operation in 2027 is well known use of this technique. Non-contact magnetic suspension reduces drag force and heat generation caused by contact friction while an object is moving at high speed. 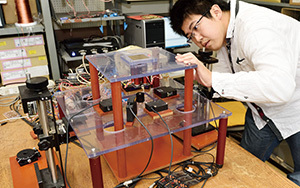 Photographs show an ampere type maglev system for an aluminum product and maglev system having four I-shaped electromagnets for three-dimensional motion of a small object. Maglev technique requires the knowledge of electromagnetics, mechanics, control theory, programming, and so on. Let’s acquire the specialized knowledge and skills, and build future maglev system together. 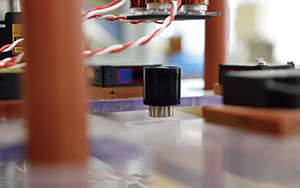 High voltage eingineering and plasma physics are the core study of our laboratory. 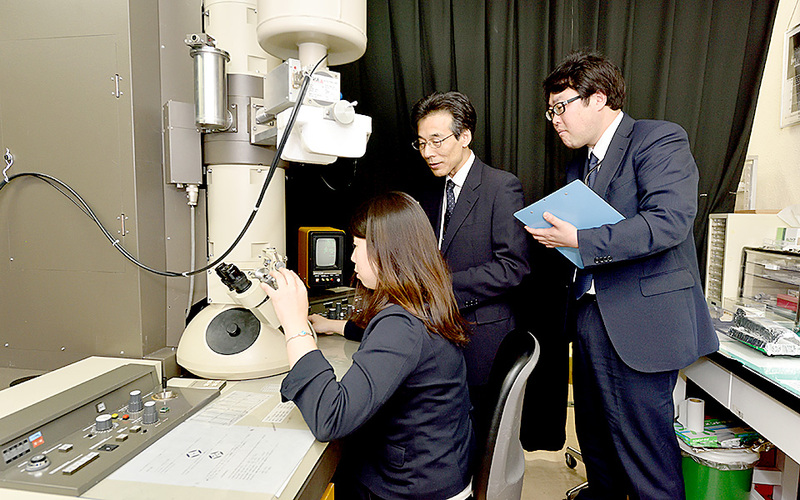 We are currently working on the development of pulsed power technology that can instantaneously generate a huge amount of electrical energy, equivalent to electric energy consumption in Japan, and its application to high-power pulsed particle beams and high density plasmas for materials processing, for example new implantation in next-generation semiconductor materials and surface treatmet of materials. We also study the application of atmospheric plasma, high power microwave, and underwater shockwave in the medical, environmental, and biological fields. Ultrasonic diagnostic equipment is widely used in clinical situations for non-invasive morphological and functional imaging of biological tissues. 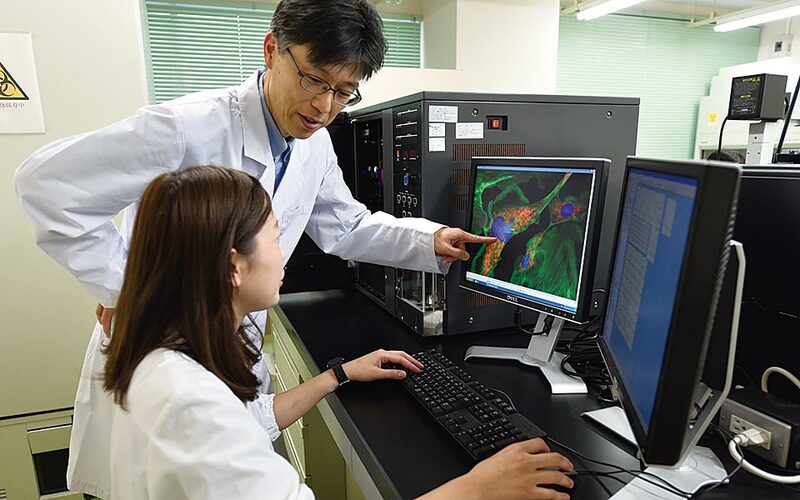 To realize more accurate diagnosis by ultrasound, we are aiming to develop methods for fast and high resolution ultrasound imaging. 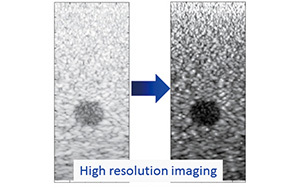 Based on such novel technologies, temporal resolution of ultrasonic imaging can be enhanced to more than one thousand frames per seconds, which is significantly higher than those of other modalities, such as CT and MRI. 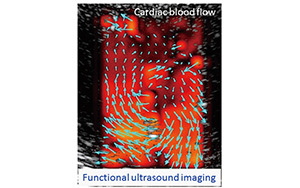 Such a characteristic of diagnostic ultrasound is one of the big advantages for accurate functional imaging, such as tissue elastography and blood flow imaging. 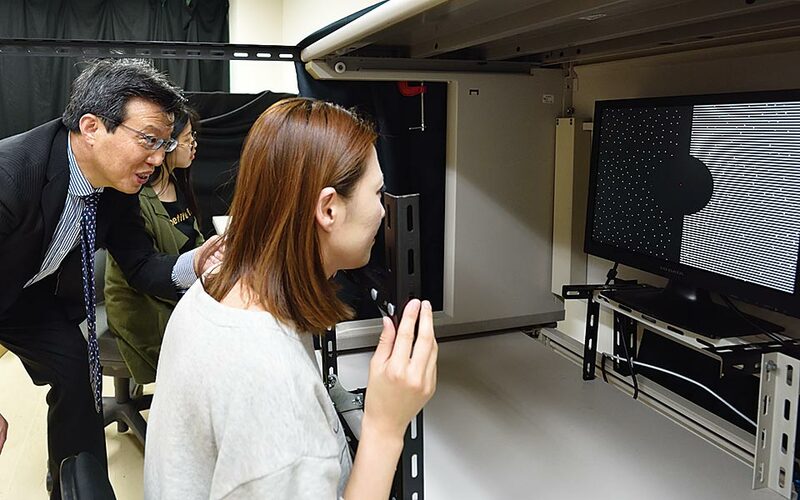 We are also studying ultrasonic measurement and signal processing technologies, which are required to establish such ultrasonic functional imaging. From March 9 to 15, 2016, a historic match of Go was carried out. The artificial intelligence program AlphaGo, developed by a team of researchers at Google Inc., USA defeated the professional South Korean Go players Lee Se-dol, with a final score of 4-1. Our team is strenuously working on the research related to machine learning, used for AI AlphaGo, such as “Artificial Neural Networks” that mimics the structure of neurons in the human brain and “Deep-Learning” which AI learns by itself. In accordance to the super-aging society in Japan, it is expected that robots are active in the fields of welfare and life assist service. 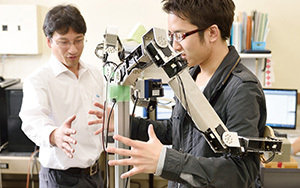 Therefore, our laboratory is developing robot systems that generate embodied interactions with physical contact such as handshakes and hugs. 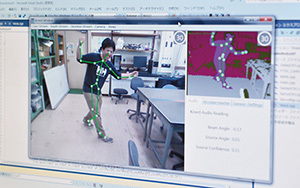 In these robot systems, human-like embodied interactions are realized without causing aversion toward the humans based on the analyses of the characteristics of human embodied interactions. 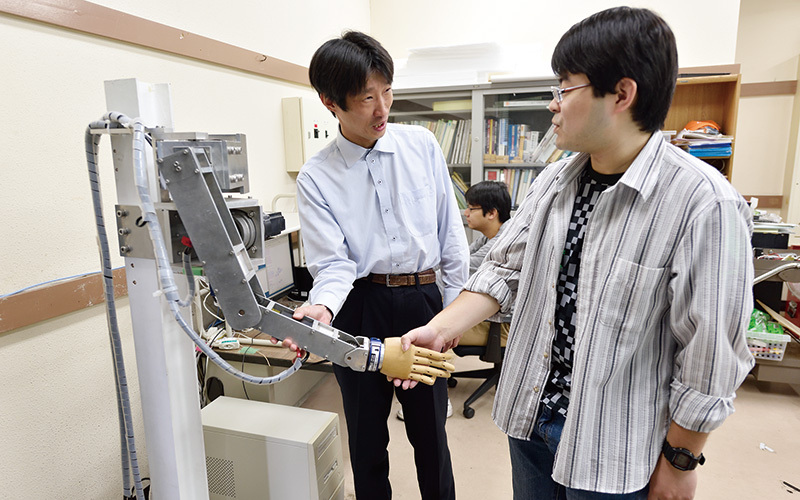 Furthermore, we apply these embodied interactions to develop life assist robots that can hand things over and hold things just like a human being. Every day, we live by using thermal energy while an inexhaustible energy arrives from the sun. Unfortunately, we waste the part of thermal energy and we can never get rid of this waste. However, reducing this wasting part and utilizing thermal energy efficiently are possible, and it is the mission assigned to us. In our laboratory, we work on this task through the study on thermal properties to influence a heat transfer phenomenon and the study on the thermal energy system. Paper sludge, the largest solid waste stream produced by the pulp and paper industry, is incinerated with a large amount of fossil fuel. 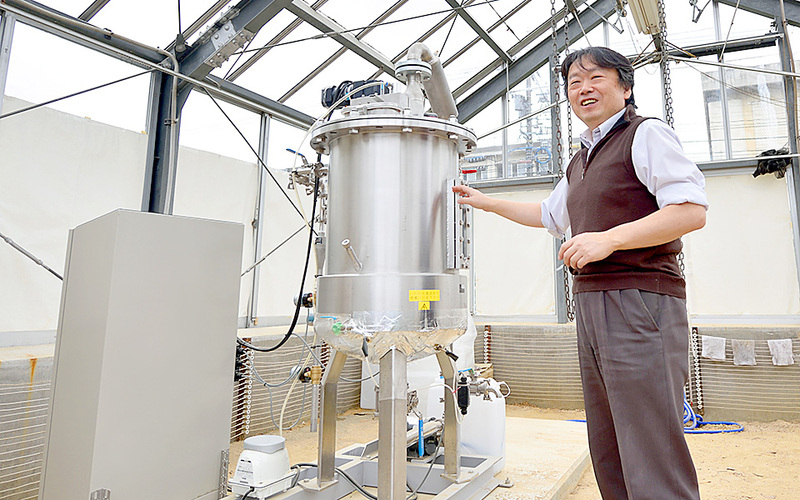 Associate Professor Hoshino succeeded in growing natural fungi and improving its resistance to high temperature, higher than 40 degrees. 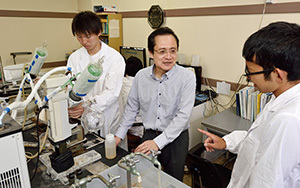 Collaborating with Chuetsu Pulp & Paper Co., Ltd. we utilize these improved fungi and develop a continuous production system that enables direct distillation and collection of a biofuel, ethanol , while separating sludge and conducting ethanol fermentation. 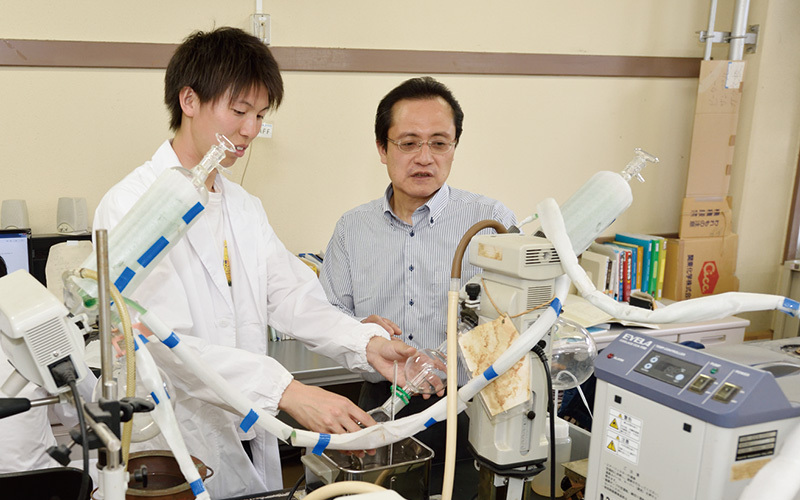 A demonstration experiment of the research has been started for its practical realization since it is identified as Technology Transfer and Innovation Program(A-STEP,NexTEP-A) by Japan Science and Technology Agency(JST). Our academic staffs have a variety of background in engineering, sciences, pharmacy and medicine. Several breakthrough projects were undertaken. For example, my laboratory made significant progress in developing recombinant antibodies for diagnostic and therapeutic applications by the combination of molecular biology and engineering. The multidisciplinary knowledge in bioengineering will help you implement exciting and diverse career options including medical and pharmaceutical industries. Bioengineering will give you the chance to explore your dreams. Establishment of a safe and secure, sustainable, and recycling-based society is an important issue today. 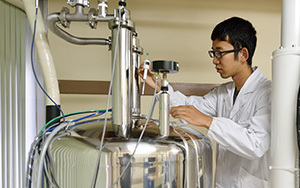 We are conducting syntheses of novel highly functionalized coordination compounds by controlling inorganic-organic hybrid chemical bonds, and developing air-stable, recyclable, regenerative, environment-friendly, and practicable metal catalysts, and chiral coordination compounds for convenient evaluation of authenticity and quality of food products, which can be useful for food safety and security. Are you interested to see what more chemistry can do to realize a sustainable society? Let’s find out together. Our laboratory focuses on creation of novel “functional organic molecules” based on the advanced synthetic organic chemistry. The newly designed organic molecules possess some potential to contribute to various fields of science such as discovery of novel medicines and agrichemicals. However, conventional synthetic technologies are insufficient to reach highly complex organic molecules. Thus, it is highly desirable if there exist new methodologies to address problems in the synthesis of them. 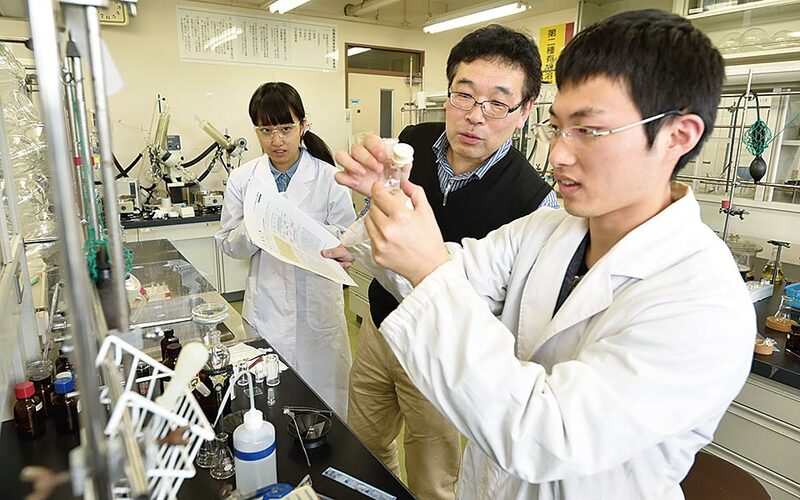 Research in our group is primarily aimed toward the development of catalytic reactions and methods for organic synthesis for the functional organic molecules. We work on developing new ‘adhesive’ aluminum alloy in collaboration with Aishin Keikinzoku Co., Ltd., a leading aluminum manufactures. Generally, alloys become brittle during the process of increasing its strength. We aim to produce adhesive and durable aluminum alloy with high strength by heating aluminum and combining elements. If we managed to do so, the materials can be very useful to absorb the impact of collision. Our current task is to establish a theory and process so we can mass produce it as practical product materials. Superconductivity is a phenomenon of exactly zero electrical resistance occurring in certain materials when cooled below a critical temperature. A practical use of superconductivity is exemplified by Magnetic Resonance Imaging(MRI), Superconducting Maglev car, etc. 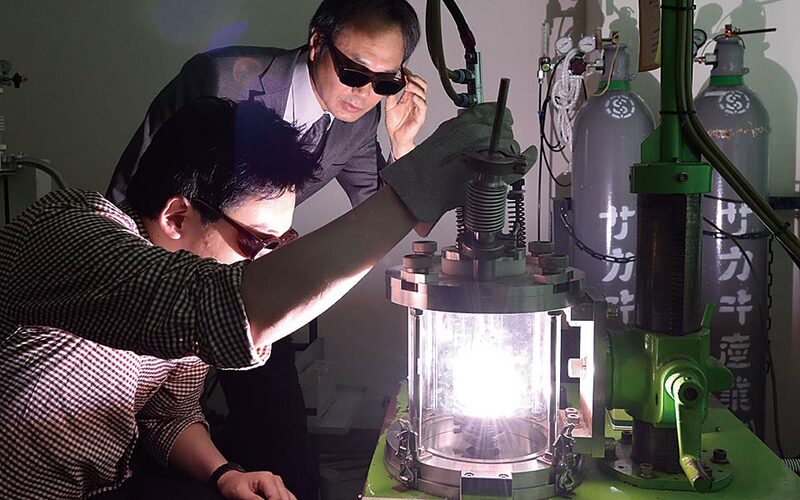 Applications of superconducting materials are, however, limited by their temperature requirements which usually occurs below 15 K. If a room temperature superconductor is realized, its application could be spread over all electrical devices, leading to an enormous progress of civilization. 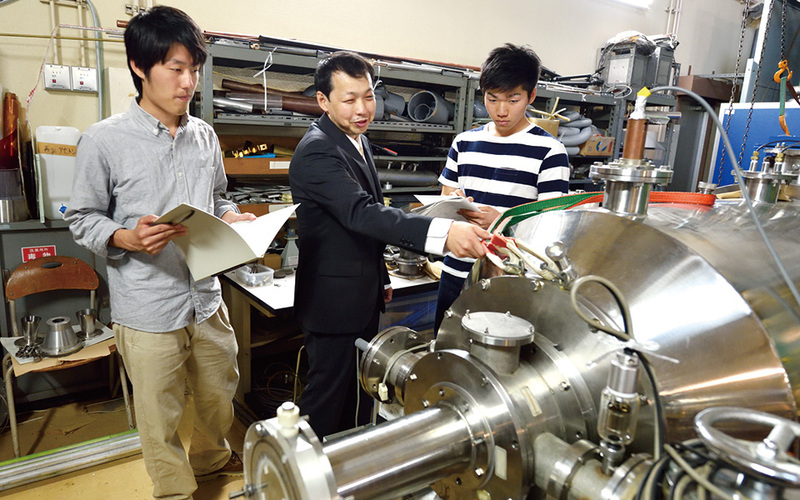 A study of new superconducting materials is an advanced task in this field. Please check the PDF below to learn more about our research activities.